The general state of affairs in my regular life and horse life right now is one of absolute bliss. 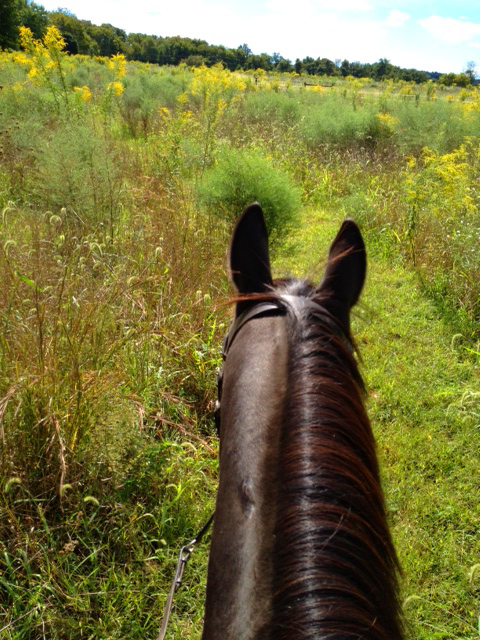 This view of my ride on Foggy yesterday in a field of goldenrod and tree seedlings illustrates what is going on in my brain and soul this September. I mention this idyllic sliver of time with slight worry and guilt. The worry is that the bottom will drop out because "when life looks like easy street, there is danger at your door" and the guilt is because I am not sure why it was decided that I get to drink all this up. Mostly I am extremely grateful. Oh, there are icky, annoying things going on right now in my life too, but for some reason, the euphoria coursing through my veins doesn't make much room for the bad stuff. I don't take any mood altering drugs or anti-depressants. I never have. I am wondering if aging in general just makes me forget my worries or at least makes them blurry, less edgy, less crisp in my mind. One thing for sure I have learned to do as I age is prioritize my day. There are a few certain activities that I try to do FIRST that make all the other stuff that I have to do and think about just not seem as daunting. When I can't do the good, fun things first, I promise myself that I will do them and I keep that promise. The day is long and can get gobbled up if I let it. There are 24 hours in each day and I try to sleep for 8 of them (on clean, crisp, sunshine-line-dried-sheets -see #4 below). That leaves me 16 hours to do both the things that I love to do and also the things that I have to do, but don't enjoy. 1. Ride at least one horse - minimum 2 hours to leisurely groom and ride. I sometimes ride three horses so this can be much longer, but I have to ride at least one horse a day to have a great day and feel complete. 2. Run - 30 - 50 minutes - this activity is best done on the trail, but 30 - 50 minutes of running anywhere, even on streets, ensures blood flow to my brain and body and makes me relaxed and calmer. Endorphins are released and euphoria is practically guaranteed no matter what life is handing me. 3. Coffee and talking with Maizie and Brian - minimum 20 minutes although we have been known to talk for hours on weekends. 4. Hang out/bring in laundry - I have timed this - a daily load of clothes for the three of us with very active, dirty, sweaty lifestyles takes me 4 - 7 minutes to hang out on the clothesline and 4 minutes to bring inside. The weather is a factor here, but sunshine dried laundry is a secret weapon against time and the horridness of the world. I hate to do laundry and I used to think it took too long to hang out, but I've learned that the payoff is worth it. This is a simple activity that has magic qualities for me and I am honestly not sure why. Four activities that take less than four hours a day to do. And, because I know how long these fun activities generally take, I don't wear a watch when I do them. I just let them flow and they miraculously stay within their four hour time frame. That leaves me 12 hours to do the work and obligations that aren't so terrific. If I can't make time for myself to thoroughly enjoy four hours a day of the 16 that I am awake, then I am not sure that life is worth it at all. Sounds like you have a good plan in place to keep centered. It's always good to make time for yourself and what makes you feel good. Of course, all the other obligations need to be done but like you say if you start the day feeling good it's not that bad. Good for you. I can't remember..are you a Libra? I don't think so but you handle balance VERY well. My Husband is a Libra and helps my firey Aries ways to find calming and when to ramp up and ramp down. :) I LOVE the coffee and family talking-VASTLY under rated in this country. Hey guys - thank you for the great comments! Grey Horse Matters - staying centered - yes, that is it exactly! Calm, Forward, Straight - You don't wear a watch ever. That is really smart. Kristen - No, I am not a Libra, but we have many Libra/Aries mixes in our life and that is a good one! You and your husband are great complements! My Dad was a firey Aries and my mom is a Libra. Maizie is a Libra too. I am floating off in the clouds and atmosphere as an Aquarian - so is my Foggy boy. We aren't actually balanced - we just zig over here for a bit and zag back over there! Love this post. I'm working on time management right now - I just enrolled in Guelph University's on-line Equine Management course. I'm impressed that you both ride and run. You must be very fit! Learning to jump properly - helpful every ride!